Did you know that the average American consumes about 24 pounds of candy per year? (yikes!!!) And for kids, Halloween marks the peak of their candy consumption… That’s scarier than the costumes! 🙂 Have no fear! Here’s a tasty treat from Quest Nutrition that you can enjoy without the guilt. …Glad you asked! In the traditional recipe most of the calories are coming from sugar, but in the Quest Bar recipe, there is a better balance of protein, carbohydrates and fiber. That means that instead of making you crave more sugar and treats, the Quest Cookie will leave you satisfied and stabilize your blood sugar (which is great for any one looking to lose weight or control diabetes). Your favorite flavor Quest Bar (Double Chocolate Chunk & Chocolate Chip Cookie Dough used in the video), you’ll need about 1 bar per cookie you make depending on the size of your cookie cutter. 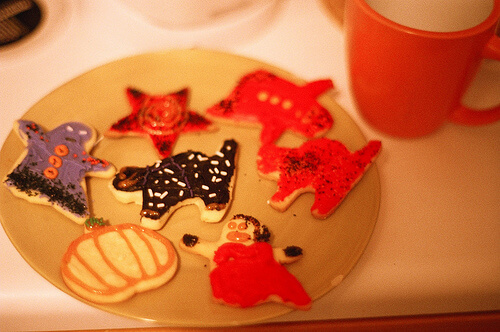 Ice your cookies, decorate and enjoy!